• Apple Watch Nike+ will be available to order on Apple.com beginning Friday, September 9, with availability in late October, in Australia, Austria, Belgium, Canada, China, Denmark, Finland, France, Germany, Hong Kong,Ireland, Italy, Japan, Luxembourg Netherlands, New Zealand, Norway, Portugal, Puerto Rico, Singapore, Spain, Sweden, Switzerland, Taiwan, UAE, the UK and the US. • Apple Watch Nike+ will be available to order on Apple.com beginning Friday, September 23, with availability in late October, Apple Watch Nike+ will be available to order on Apple.com beginning Friday, September 23, with availability in late October, in Czech Republic, Hungary, Poland and Russia. 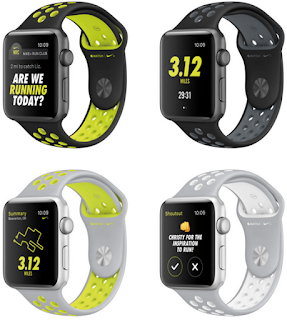 • Apple Watch Nike+ will also be available in late October in Costa Rica, Greece, India, Israel, Macau, Mexico, Qatar and Saudi Arabia.